The Parrots flying start to the season continued, with a strong all-round performance putting league newcomers United Amateurs to the sword. The build up was far from smooth though, late on Friday It came to light that no kit was available; the the club is indebted to our friends at HAC for the use of their ‘Barcelona away’ kit. Amateurs were out of the traps fast and it was largely one way traffic for the first ten minutes, but Sporting’s defence was resolute and in reality the goal was barely threatened. Slowly but surely the Hackney started to take control. The excellent delivery of Matt ‘Bambi on Ice’ Harris, both from set plays and the left flank, looked like the most likely way a breakthrough would come. After the 15 minutes or so midfield duo Sharpe and Dillnutt began to dominate the midfield battle; the latter was unlucky to be cautioned when it appeared he was the victim, rather than perpetrator, of foul play. Finally the deadlock was broken; and how. Crisp interplay under pressure in the defensive third between Dillnutt, Colvin & Sharpe opened up a crossfire ball to Harris, he fed the in-form Badu who applied a calm finish over the onrushing keeper. It was a goal that would have sent 100,000 at Nou Camp into a state of uncontrollable ecstasy, as it was the Marshes crowd of about six acknowledged it was pretty good for Division 3 of the Essex Veterans League. There were further opportunities for the Parrots as Page’s pace caused problems for the visitor’s defence, but sadly his final pass did not. 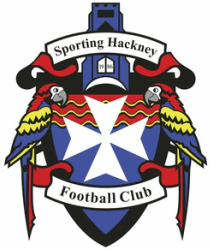 Whilst United’s effort did not wane, in the second half Hackney’s superiority began to tell; individual battles were being won in all areas of the pitch. After failing to convert a few opportunities, Hackney doubled their advantage 15 minutes into the second period. Harris delivered a trade-mark bullet of a free kick from the left and Dillnutt rose like the proverbial salmon to guide a fine header into the roof of the net. For the next 20 minutes the contest was largely between Sporting and the opposition’s keeper, who made a number of notable saves. Chances came and went, but having already struck a post Page finally got his just desserts with a smart strike from the edge of the box. The visitors continued to push, but with over 180 years of life experience between them the back four had seen it all before. Ably supported be Tarn between the sticks they ensured the vague threat of a comeback was comfortably extinguished. Manager Duff commented “It was a great performance from the lads today, United Amateurs averaged over three goals a game last season so the clean sheet is particularly pleasing."